As writers, we all struggle with confidence now and then. The early days can be brutal as we struggle to transform a passion into a skill. Criticism from outside sources can be painful, but if you learn from it, your writing improves and your confidence grows. The worst criticism doesn't always come directly from outside sources, but from yourself. 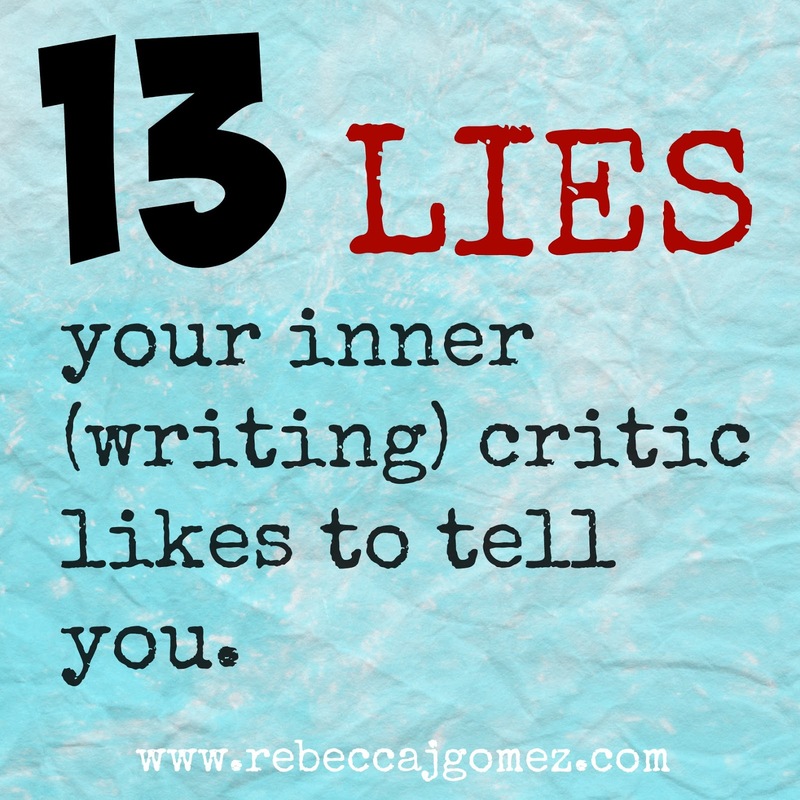 When you are feeling vulnerable after a series of rejections or you can't see the proverbial light at the end of the tunnel, you may entertain the lies that your inner critic likes to whisper. It's good to know what those lies are, so that you can look your inner critic in the eye and tell them to take their negativity and scram! 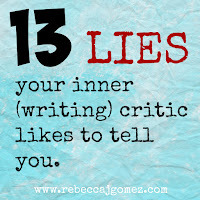 So here are 13 of those lies, and how you can rebut them! 1. You aren't really any good at this writing thing. No one is a perfect writer; there is always room for improvement. But even if you need A LOT of improvement, that doesn't mean you're no good. If you're passionate about writing, you must have at least a modicum of ability. So start where you are, and go from there. 2. No one will ever want to read your work. It may seem like this at times, but that doesn't make it true. You will find your audience one day if you keep it up, even if it's small. 3. Pursuing your dream is a waste of time. Bogus! It doesn't matter if your dream is to publish a novel or to ride a unicycle around Lake Superior. Pursuing your dream will help you grow in your skill and as a person. 4. It doesn't matter how much you practice. "Practice makes perfect" isn't technically true, but the more you work on honing your craft, the better you will be. 5. Writing a children's book is a silly idea. Ha! This could only ever possibly be true if children's books themselves were silly, trivial things. And we all know that is far from true! 6. You can't write about that. You don't have the experience! Yeah, yeah, I know. One of the "rules" about writing is "write what you know." But if we all took that too seriously, we would seriously limit ourselves as authors. Of course, life experience can do wonders for our writing, but reading and research can go a long way too. 7. You need a writing degree to be taken seriously. Nope. Not a bit true. Lots of people write (and get published) without having ever stepped foot inside a college classroom, much less having earned a writing degree. I'm one of them! 8. You're too old to write a book. If you're capable of generating ideas and turing them into stories, you are young enough to write a book. 9. You're too young to write a book. See number 8. Switch "young enough" to "old enough." The younger you are, the more practice you may need, but that doesn't mean you are ever too young to start! 10. You don't have time to write a book. Sure you do. You just have to use the time you have wisely. 11. Your voice isn't important enough to matter. Isn't your voice different from the voice of every other individual on the planet? There you go. 12. You have to be funny to write a children's book. Nope. Not every children's book is supposed to make kids laugh. 13. You don't have anything unique to offer. See number 11. If you, as an individual, are unique, then you have something that no one else has. Your "you-ness." Take some time to discover what that is, and make it work for your writing. What has your inner critic been whispering in your ear lately? Thank you, Samantha. Glad to help! Thank you, Kathy. We all need these reminders sometimes!